The Caproni three-engined bomber appeared in 1914, powered by three Gnome rotary engines. 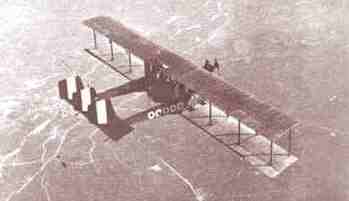 The production version, equipped with three 100 hp fixed in-line Fiat A 10 engines entered service in the summer of 1915, and it was the most effective bomber of any air force, excluding the Russian Sikorsky. The same model remained in production throughout the war, first in its 350 version (with two Fiats and one Isotta Fraschini engine) and then as the Ca 450 hp, with three Isotta Fraschini V.4B 180 hp engines. Several hundreds were built, and it equipped bomber squadrons 1 to 15 (of which 11a Squadriglia operated in Albania, and 12a Squadriglia in Lybia, while 3a, 14a and 15a were sent to France in 1918) and 201a Squadriglia of the Naval Aviation with single examples going to home defence flights. All designations such as Ca.31, Ca.32 etc. are spurious post-war reconstructions: this bomber was exclusively called Ca 450 hp or Ca.3. The first models had a three-men crew, formed by two pilots and an observer-gunner in the nose, but all later Capronis had a fouth crew member, a gunner who operated from a turret rising above the central engine. Its production was scaled down in 1918, but as its successor, the Ca.5 600 hp, proved a failure, it was hurriedly put back in production in the Savigliano plant. The last version was the ca.3 Modificato, with folding wings, that was even reintroduced in production in 1923, some 150 of them being produced for the Regia Aeronautica and serving in bomber units until 1927, 13 years after its initial flight. Many Caproni were used at Foggia for the instruction of American pilots, who also used it operationally, with exrtreme distinction, flying in Squadriglie 1a, 2a, 4a, 5a, 6a, 7a, 8a, 9a and 10a.